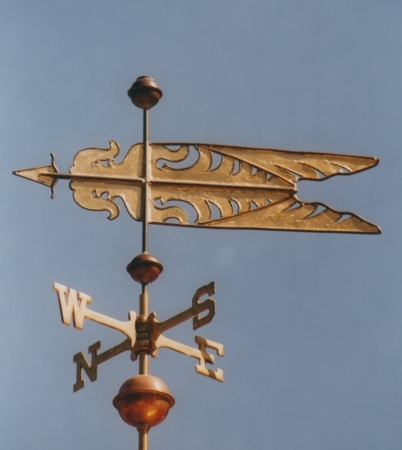 The Art Deco Weathervane showcased here was designed as a matched pair by an architect whose work is informed by Art Deco* and the Arts and Crafts movement. It captures the signature use of geometric forms and conveys a nice sense of energy. This is one of my favorite designs and we have one in our own personal collection. 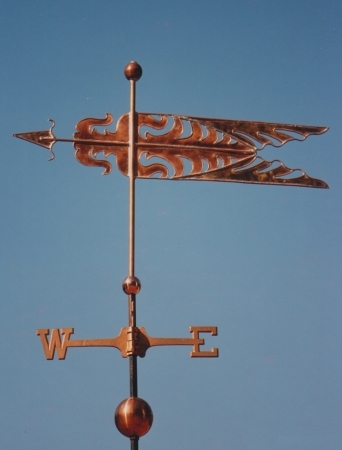 As with all our designs, you can choose the metals we use in crafting the vane. We offer it in all copper, copper and brass, or copper and nickle silver. And you may choose to add optional gold or palladium leaf gilding, which would maintain a bright contrast as the ferrous metals age and patina. Ours was made with some optional gold leaf. In the pictures above, one banner is copper, the other is gold leafed. *Art Deco was a popular international art design movement from 1925 until the 1940s, affecting the decorative arts of architecture, interior design and industrial design, as well as the visual arts. At the time, this style was seen as elegant, glamorous, functional and modern. Its popularity peaked in Europe during the Roaring Twenties and continued strongly in the United States through the 1930s. Although many design movements have political or philosophical roots or intentions, Art Deco was purely decorative.